Lieutenant-Colonel John Edmund Francis d’Apice, DSO (1877-1952) was a Chevalier of the Order of the Lion and the Black Cross. Born at Hunter’s Hill, Sydney, Australia, of Southern Italian descent, he was educated at the Jesuit College (St Ignatius), Riverview (Dux 1896), obtained the degree of Bachelor of Science in engineering of Sydney University (1899) and was later called to the Bar (Gray’s Inn). He was an active sportsman both at school and university. 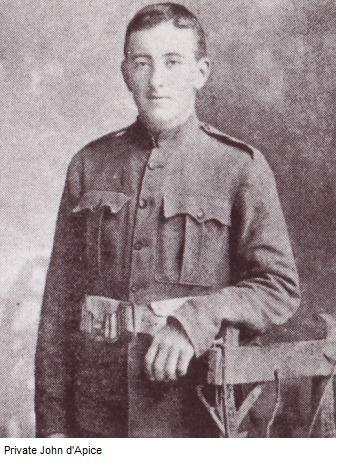 As a young man he enlisted in the 1st New South Wales Mounted Rifles and then saw action with them and the Royal Artillery as a Private in the Boer War, serving at operations in Orange Free State, including actions at Poplar Grove, Dreifontein, Karee Siding, Vet River and Zand River; in the Transvaal and Orange River Colony, including actions at Bethlehem and Wittebergen; in Cape Colony, South of Orange River; and in the Transvaal and Orange River Colony, all between 30 November 1900 and 31 May 1902. He was awarded the Queen’s Medal (4 clasps) and the King’s Medal (2 clasps). He transferred to the Royal Garrison Artillery in South Africa as Second Lieutenant in 1900 (gazetted Lieutenant a year later), and continued to serve in the Army after moving to England some years subsequently, including in the First World War. He was on the staff of the 29th Division at the original landing at Gallipoli, and also served in France and Egypt. He was twice wounded, twice mentioned in Dispatches and awarded the Distinguished Service Order in 1915. In 1904 he was married to Mary Holroyd Ratton (d. 1959), with whom he raised a family, retiring from the Army in 1932. His later years were spent on Jersey. He was appointed Officer (4th Class with Swords) of the Order of the White Eagle of Serbia in 1918, and Knight Commander of the Order of St Gregory the Great (with Star) in 1946. An active Roman Catholic, his peacetime career included a directorship of Burns, Oates and Washbourne, the Catholic publishers, the leadership of pilgrimages to Rome, membership of the Southwark Rescue Society and an active organizational role in the United Services Catholic Association. During the Second World War he worked with the Forces Information Centre in Trafalgar Square.